When arthritis leads to severe knee pain and reduced mobility, total knee replacement (TKR) surgery is a highly successful option. The traditional procedure involves a 10-12 inch incision, cutting the quadriceps tendon, and flipping the knee cap. Although TKR relieves pain and improves function, recovery is generally slow and painful. Now there's a better way. With Small Incision TKR , surgeons use miniaturized instruments to make an incision of just three and a half to five inches-40-60 percent smaller than with traditional surgery The quadriceps tendon is not cut. instead, muscle fibers are spread apart and the kneecap moved out of the way. "Small incision TKR is safe and less invasive than traditional TKR," says Steven B. Haas, MD, associate chief of the Knee Service at the Hospital for Special Surgery (HSS), who developed the new technique. A study of more than 100 small incision TKR surgeries at HSS showed patients recover more quickly and have a 25 percent faster regain of range of motion in four to six weeks, compared to more than three months with traditional surgery. Patients also had less pain and needed 33 percent fewer postoperative pain medications, according to Richard S. Laskin, MD, co-chief of the Knee Service at HSS. Roughly 75 percent of small incision TKR patients are women. The procedure is especially relevant for them because they develop arthritis of the knee (the main reason for TKR) more commonly than men. Women are also better candidates than men for small incision TKR because their smaller bones and muscle mass allow easier visualization of the surrounding area. "Women are more flexible than men, so they improve very quickly. Their ultimate range of motion is better," comments Dr. Haas. "While the main purpose is improved function, women also appreciate the cosmetic aspect. It's far more appealing to have a small incision." The principle underlying Small Incision TKR, says Dr. Haas, is avoidance of cutting more than necessary. Less damage to healthy tissue leads to faster recovery. "in any surgery, surgeons cut the uninvolved tissue to get to the involved tissue," he says. "We want to minimize cutting normal tissue." Dr. Haas notes that the term knee replacement is technically inaccurate since the procedure involves resurfacing the knee, similar to the way a crown covers a tooth. Surgeons remove the diseased surface of the bone and then contour it. Next, they attach an implant, similar in shape to the surface of the knee, inserting one end into the thigh bone (femur) and the other component atop the front leg bone (tibia). The implant replaces articular cartilage worn away by arthritis, so the bones no longer painfully grind against each other. The kneecap is then moved back into place. The implants, made of metal or ceramic combined with plastic, are flexible, strong, and are very durable. Following small incision TKR, patients enter a rehab program, just as they would after traditional TKR surgery. The difference is quicker regain of function. Prior to surgery, many patients have only a 90-100 degree range of motion. (Healthy knees can flex between 125 - 150 degrees.) After six weeks of rehab, they typically have 90 percent, or 115 degrees, range of motion. They regain further motion after two months. Small incision TKR is applicable to a wide range of people. "Age doesn't matter, but most patients are 40-80 years-old," notes Dr. Haas. "Seventy to 80 percent of all patients with severe arthritis, and at least 85 to 90 percent of women with severe arthritis, are candidates." Those who are morbidly obese or who have knee incisions from previous surgeries are not good candidates. Patients who have undergone both traditional TKR and small incision TKR say the difference is remarkable. Although they report satisfaction with the results of traditional TKR surgery, most say they put off doing their other knee because they had such a hard time recovering. "They say, if they could have had the new surgery the first time, they would have had the second one much sooner," says Dr. Haas. 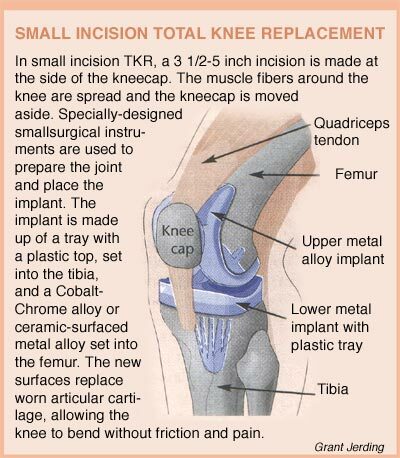 Small Incision TKR is currently performed in only 12-15 medical centers around the world. By year's end, it should be more widely available, as more surgeons become trained in the procedure.